"In an industry where over-hyping followed by disappointment is common, it is rare to find a game where the opposite is true. This is the case with Red Storm's  release, Dominant Species. Adopting ideas from other genres and innovating on its own, here we have a serious contributor to the real-time strategy genre. In many ways, the engine is reminiscent of Myth's. You fly low over the map, ordering units to do your bidding. Dominant Species gives you more flexibility than Myth: you have full control over your perspective and can move freely in three dimensions. The highly customizable interface has lots of features that make this easy. One great option is to have the view follow a unit. This allows you to see the battle without constantly messing with the controls, which is nice as the units are fast-moving and the maps are often huge. Graphically, the game is impressive. Enormous cliffs, rolling hills, and glittering lakes add a lot to both the aesthetic and strategic portions of the game. The only objection here is the choice of colors; dull greens and browns are common. However, the sky and water are nicely done and all of this is integrated well into a smooth, consistent world. Speaking of graphics, the units look fantastic. Three-dimensional models are used and the fluidity of movement and melee combat is excellent. Many of the units are a little comical. Gauphs, the worker units, bounce merrily across the screen; it's hard to resist a chuckle seeing these guys jump about. Human infantry are not taken too seriously, either; they look and move like someone stuck all three Stooges into the same space suit. Many effects like these give the game its great atmosphere. 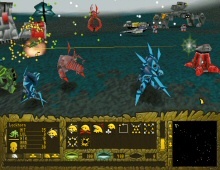 The game features traditional RTS gameplay -- build a base and harvest resources. Instead of buildings, bases consist of really big plants. This makes defense rather amusing -- it is not often you see a houseplant shooting fireballs at an approaching mob of bumbling astronauts. The bases themselves usually have only a few buildings; there are no sprawling kingdoms with impenetrable defenses as found in other games. The game emphasizes efficient use of units rather than base construction, which many will find a welcome change. Like most games of this genre, the artificial intelligence is a bit quirky. Some aspects of it are quite good: when attacked, units will group and defend themselves automatically. Unit pathing is decent, but occasionally a unit will get stuck on a building and take several seconds to realize it has to go around. The only real problem with the game is that the enemy AI sometimes misses obviously good moves. However, most of the missions are quite difficult, and it is the occasional AI mistake that makes them winnable. Dominant Species manages a wonderful balance between graphics, strategy, and humor. The units are excellent, as is the execution. In short, Red Storm has given us a remarkable product that has value for any fan of the real-time strategy genre."